There are a number of methods for wrapping or swaddling a baby however, the Joey Pouch® makes this so simple that even Dad, the Grand-parents or the Babysitter won't be able to use the excuse that they don't know how to wrap or swaddle. You can place baby's arms a number of ways or wrap the Joey Pouch around baby's arms as they fall naturally. Typically, up near their face/ears to prevent baby pulling up the fabric as they move to their favoured position. Just remember that babies also have preferences and are not all going to necessarily like to be "Mummified". The Joey Pouch® is intended to simulate a mother's womb and therefore babies are able to move by kicking their legs and moving their arms just as they were able to move in mum's womb! The Joey Pouch® has been made long to accommodate baby as they grow. Any excess fabric at the bottom of the Joey Pouch® is to be tucked into the bottom of the cot, bassinette or similar. A child's safety is the responsibility of its parents or carer. Do not let baby overheat. 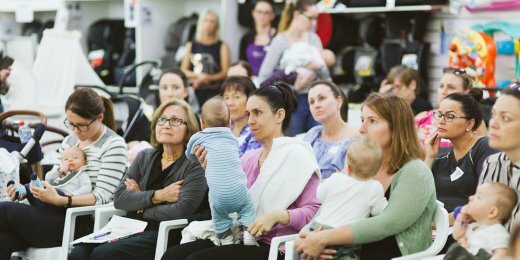 Please use the Temperature Guide as a guide only as a number of factors should be considered when determining the clothing to be worn by baby under the Joey Pouch®, including whether baby is ill, the temperature of baby's room, the clothing baby is wearing. Do not use the Joey Pouch® with a doona, duvet or quilt. SIDS and KIDS recommend sleeping baby in a cot or bassinette next to your bed for the first few months of baby's life. Ensure that baby's head can't slip down through the neck hole of the Joey Pouch® when the product is wrapped around baby and fastened for use. Adjust baby's clothes according to the temperature of baby's room. Also be mindful of the temperature when baby is sleeping in another room, for example, when staying with friends or relatives, when on holiday or other unfamiliar rooms. Check baby's temperature regularly by placing the back of your hand on the back of baby's neck and/or chest. Always keep baby away from any fire source.